The discovery of 26 bodies with lethal injuries in a 7,000 year old mass grave in Germany provides more evidence of organised large-scale violence in Neolithic Europe. 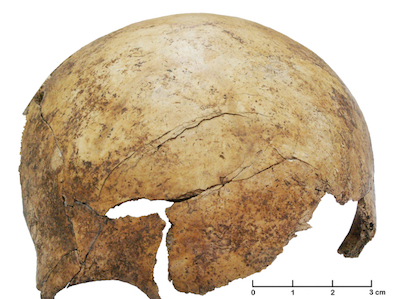 The findings, reported in the journal PNAS, also help us understand the sudden and perhaps brutal ending of central Europe’s first farming culture. The Linear Pottery (Linienbandkeramik, or LBK) culture which dominated central Europe between 5600 and 4900 BC was once depicted as peaceful and pioneering – farmers who cleared land and carved new communities out of the heavily-forested “wilderness”. This view began to crumble with the discovery in the late 1980s of a mass grave at Talheim in southern Germany, containing the remains of 34 men, women and children, many of whom showed evidence of lethal injuries caused by stone axes. This was followed not long after by the findings from an enclosure (a precursor to fortified Roman army camps) at Asparn/Schletz in Austria. Here, the remains of 67 people were found lying in haphazard positions in the bottom of just one section of the enclosure ditch, the implication being that many more individuals are represented across the site as a whole. It is clear that they too died violently, with many skulls showing signs of multiple blows. That fact both of these massacres – no other word can be applied – fell near the end of the Linear Pottery culture, around 5000 BC, raised the possibility that things ended less than peacefully. In the latest paper, a German team led by Christian Meyer present the recently discovered third instalment in this story. A long trench at the site of Schöneck-Kilianstädten, central Germany, held the remains of at least 26 individuals, found commingled in a mass grave, again with evidence of multiple injuries showing no signs of healing. Most were caused by stone axes, but there were also arrowhead wounds. This was almost certainly a single event, again dating to around 5000 BC. Intriguingly, as at Asparn/Schletz, the graves contained no children aged 9-16 or young women. This suggests the capture of children and young women may have been one of the motivations for conflict, as it has been in more recently recorded societies around the world. These events were devastating not only to those involved, but to the entire society. While we have only the vaguest idea of the total population of Neolithic Europe at any particular point, we do have some sense of the size of local villages – usually around 50 to 100 inhabitants. Thus, the deaths of even 26 or 34 people represents an event that, scaled up for an appropriate comparison with modern population levels, would entail killing on a scale seen today only in the most war-torn countries. Archaeology deals with fragments of the past, and there is always the possibility of bias in what survives and what does not, as well as in what is found and what remains hidden. Add to this the fact that radio-carbon estimates provide a date range rather than a specific year and the discovery of one massacre falling at approximately the same time as the disappearance of Linear Pottery may be no more than a coincidence. The finding of a second example begins to suggest a pattern, however tentatively. The discovery of a third case looks very suspicious indeed. The question that naturally arises is why this particular point in time should see such a widespread outbreak of conflict, involving the killing of what could easily be the entire populations of small hamlets. While there is certainly evidence of conflict both before (including among the hunter-gatherers that preceded the Neolithic) and after 5000 BC, this usually takes the form of isolated incidents involving relatively few individuals. These mass graves were the result of something larger and more organised. One theory blames the environment. A period of climatic instability led to increased competition for resources and eventually to conflict – including the extermination of some entire communities. This interpretation very much divides the room. Many researchers take exception to what they see as an overly simplistic, environmentally deterministic explanation, and favour internal causes for conflict. Other strategies could have been employed to cope with shortages, emphasising greater cooperation rather than competition. There is also the problem of precisely correlating climatic records and archaeological events. While there is some evidence of a climatic downturn at the end of the 6th millennium BC, there is still considerable leeway in the dating of both this downturn, and in the massacres discussed here, making it very difficult to link them in a causal way. The findings at Schöneck-Kilianstädten will no doubt fuel this debate, and rightly so, since it is an important one that is not without implications for our own future. Some studies have suggested that global warming is likely to lead to a massive increase in levels of conflict worldwide. If such a link does turn out to have been the case in Neolithic Europe, it would be depressing if we have not learned anything in the intervening millennia that would enable us to avoid a similar fate. Rick Schulting is Lecturer in Scientific and Prehistoric Archaeology at University of Oxford. This article was originally published on The Conversation. Read the original article.